Authored by: Stanley A. Rice, Ph.D. Evolutionary science encompasses not only some of the greatest breakthroughs of modern science, but also the most controversial. Encyclopedia of Evolution, Revised Edition contains hundreds of entries that span modern evolutionary science and the history of its development. This comprehensive volume clarifies many common misconceptions about evolution, including whether the process of evolution has been observed; biological evidence from DNA; and whether any "missing links" have been found. Biographical entries represent evolutionary scientists who have had and continue to have a major impact on the broad outline of this field. 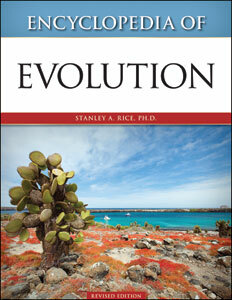 Five essays that explore interesting questions resulting from studies in evolutionary science are included as well. How much do genes control human behavior? What are the "ghosts of evolution"? Can an evolutionary scientist be religious? Stanley A. Rice, Ph.D., is professor of biology in the Department of Biological Sciences at Southeastern Oklahoma State University in Durant. His current research involves evolutionary ecology, and he has published articles in such peer-reviewed journals as the American Journal of Botany and American Biology Teacher. He has made numerous presentations to scientific societies and is the author of Facts On File's Encyclopedia of Biodiversity.